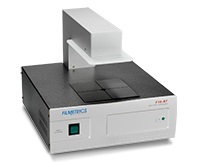 Profilometry is a common and easily applicable method for metal film thickness measurements. All that is needed is a step from an uncoated to a metal-coated area to determine the step height and therewith the metal thickness. With profilometry, there is little need to know specifics about the material under investigation, and the maximum measureable thickness is only restricted by the maximum measureable thickness of the optical profiler used. 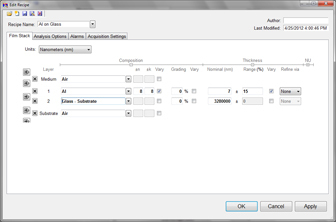 The step-height accuracy depends on the vertical resolution of the profiler. 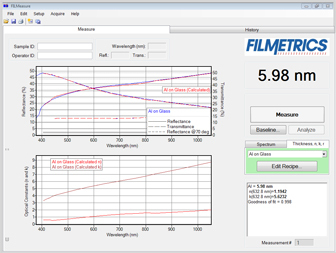 In the case of the Filmetrics Profilm3D, the accuracy is 0.7% for an 8 µm step – which means 56 nm! For very thin films, spectral transmittance (ST) measurements are an alternative and less expensive way to measure thickness. 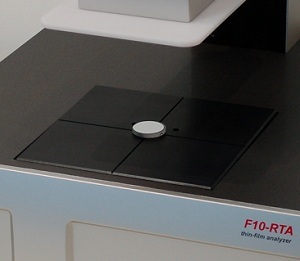 For this kind of measurement, Filmetrics offers the F10-T. For ST measurements, the maximum measureable thickness depends strongly on the metal at hand (see table). However, there are a few limitations to this approach. For one, the substrate material must be transparent. For another, the optical constants of the material under investigation must be known to get accurate results. Often, this is uncritical because Filmetrics provides a large database of material data files with its instruments. If, on the other hand, the material’s properties are unknown or changing on a regular basis (e.g. 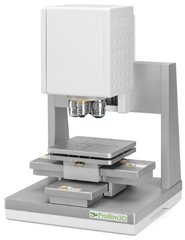 if coating process parameters are changed occasionally), the sole measurement of ST is not enough. In this case, the following approach of combined spectral transmittance and spectral reflectance is more suited. If the optical properties of the material are unknown, a simultaneous measurement of spectral transmittance and reflectance can be used to determine the optical constants and to measure the film’s thickness in the same process. In this case, the measurable thickness range is about half of ST measurements. The instrument of choice for this is Filmetrics’ F10-RT, which is priced about the same as our Profilm3D optical profiler. This particular sample was a thin film of aluminum on a glass substrate. 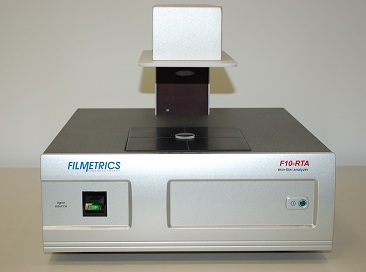 In order to solve for thickness as well as optical constants, measurements were taken on our F10-RT system, which combines reflectance and transmittance at normal incidence. Through the use of our “No Model” model, we measured the thickness and optical constants of this metal film, all with a single mouse-click.